It was an amazing night of fights Saturday April 9th, and SBG Niagara absolutely crushed the competition by dominating an exhibition K1 Kickboxing match, winning two MMA fights and winning both the 145 AND 155 pound Underground Combat Series Amateur MMA Titles. As proud of these wins as I am, it is the comments from promoters, fans and other team's athletes that really make me proud of how my TEAM and I conduct ourselves, both in and out of the cage. Words others have used to describe us are respectful, professional, humble, among others. I pride myself on our TEAM's conduct, and this will always be the norm for us, not the exception. My 145 pound CHAMPION. Pesh fought a great fight, coming back from some adversity to dominate with his jits and get the unanimous decision. Pesh started with me with no experience at all...trusted in me...put in the work that was required and then some...devotedly loyal...and always supports the TRIBE. A privilege to watch him grow, both on and off the mats. There are some very big things coming in his future, and it is a absolute privilege of mine to play a small part of it. This was just the start of something beautiful! A well earned TITLE indeed! My 155 pound CHAMPION. Anyone that knows me understand how blatantly honest I am. THIS is the belt that I wanted the most. The opposing team specifically requested to fight us for this, and I take things like that to heart. As I was told, they did it respectfully, so I in return said we would give them all the respect they can handle. Justin totally dominated the fight, from striking to clinch to ground. It was an absolute pleasure to witness. Justin started with me with no experience. He puts in the work as I ask, and he is relentless in his pursuit of improving himself. 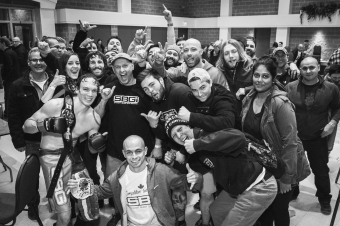 Loyal to the end, he epitomizes what SBG is all about. He helps lead our TEAM by his actions both on and off the mats, and I so look forward to what the future is bringing our way. He is an incredible human being, selfless, and one of the most sincere people you could have as a friend. When the next team wants to challenge us, bring it. We "stay ready". THAT's the SBG way! I met Austin at one of my high school SAFE Programs. Of all the kids in the class, I knew that he would be one that would keep his word and actually come to my gym and join. He did. Austin works so hard at improving himself, day in and day out, both on and off the mats. He is one of those guys that would never quit, and his work ethic has been rewarded. He put on a one of the most technical display of kickboxing this night, and I have already had requests for him (and my other athletes) to fight for other events. I am very proud of how Austin has developed as an athlete, but more important to me, as a person. He is first class all the way! Allan started with me when he was a kid. Took time off, and came back to begin training as an adult. A phenomenal human being, and tough as nails. One of my most technical athletes, and you better hope he doesn't get his hands gripped around you because they aren't coming apart! Coachable, a relentless work ethic, and he has the most incredible posture you will see. I am very proud of the man Allan has become, and trust me, there are big things coming this young man's way. So proud of Jermaine. He had a victory for just showing up. Most people do not know the adversity he faced from the first thing morning of the fight. I'm not at liberty to say, but it was enough of a situation that I was ready to cancel the fight. Jermaine would not have that. He stepped into that cage and put on an impressive display of control with his clinch game. I am so happy of what he accomplished this night and I am proud of how he has progressed over the past few months. Every event I say how special it was, and I don’t think it can be topped. Well, we keep moving forward and doing just that, topping our previous performances. I did things the right way. Took my time. Built my TEAM with LOYAL, DEDICATED and HARD WORKING athletes. ALL HOMEGROWN. NO hard contact training sessions. NO injuries in training. NO ring. No cage. We train the SBG way. Intelligent. As Coach Kav says "upgrade the software without damaging the hardware". With that being said, I have already reviewed our performances, and I have made the lesson plans for this week to rectify any of our weaknesses. So for those that want us, you are welcome to come and get it. We look forward to the challenge.